Basel is an industrial centre set on the river Rhein bordering France and Germany. There are three bridges over the Rhein that carry trams, and most of the central area one metre gauge track is street running, although there are grassed reserved tracks running out to the suburbs. The urban tramway BVB in a smart green livery provides nine of the routes, whereas the suburban tramway is BLT in a yellow and red livery running three routes, 10, 11 and 17. BVB still operates a varied fleet of trams, some of the older cars being articulated, but many still run with trailers dating back to the 1960’s. Our filming starts outside Central Bahnhofplatz where we capture both BVB and BLT trams in action. We then ride on tram 666+1441 to St. Alban Graben on route 2 to commence our filming at Steinenberg and Barfüsserplatz. This pretty part of the city produces a super background as we see BVB and BLT trams in action. A trip along Falknerstrasse and Gerbergasse brings us to the beautiful Marktplatz, a busy scene with trams and the hustle and bustle of the market. High above the river Rhein we film the trams running along Mittlere Brücke before boarding tram 664, a 1990 ABB Siemens car running route 15 to Bruderholz. From our arrival here we see car 461+1469 arriving on route 16. It changes to a 15 for the run back to Marktplatz. This immaculate tram is a SWP/BBC vehicle dating from 1967, its trailer from 1968. The next ride we take is on board BLT number 156, a 2011 Stadler Rail Tango vehicle on route 11 to Surbaum. At this point many of the passengers continue their journey by bus, which was a Mercedes-Benz Citaro. More filming is done at Aeschenplatz, where we see car 637 a 1972 Düwag/Siemens on driver training duties. Our Basel filming closes where we started at the Central Bahnhofplatz. Our next venue is Lausanne. This southern lakeside city is mostly served by trolleybuses. There is a small standard gauge tramway, but for the purpose of this programme we concentrate on the trolleybuses. The current fleet is made up of both rigid and articulated vehicles, as well as a large fleet of trailers. 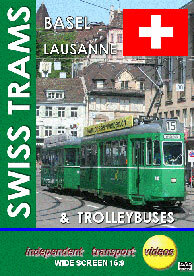 The older trolleybuses are of Hess and Lauber manufacture, the newer ones are standard articulated Hess Swisstrolley BGT-N2C type. Some of the older trailers date back to 1974, the newest ones from 2006. Our filming starts at the Place de la Gare before moving along to Rue Caroline and Rue Saint-Pierre. A good deal of action is then filmed at Av. Benjamin Constant with most types being captured by our cameras. Final scenes are filmed on Rue du Grand-Pont. The livery is overall white with blue coloured blocks. An interesting fleet in an interesting city, which we are sure you will enjoy the comparisons with Basel in the north. Duration : 65 minutes (approx).